This is the shocking story of the murders of six people at the Hinterkaifeck farmstead. 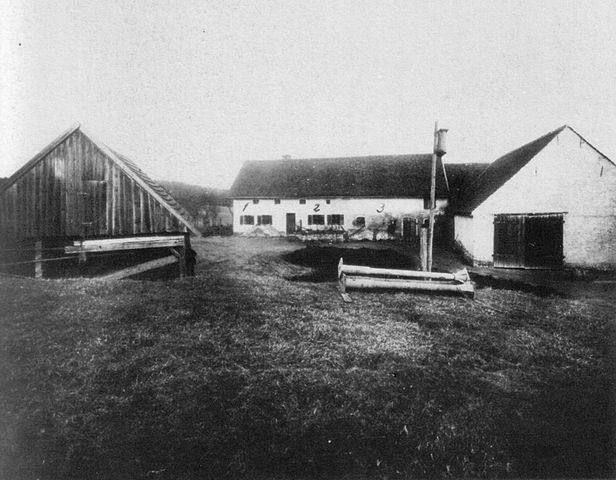 Hinterkaifeck, a small farmstead situated between the Bavarian towns of Ingolstadt and Schrobenhausen (approximately 70 km north of Munich), was the scene of one of the most puzzling crimes in German history. On the evening of March 31, 1922, the six inhabitants of the farm were killed with a mattock. The murder is still unsolved. The six victims were the farmer Andreas Gruber (63) and his wife Cäzilia (72); their widowed daughter Viktoria Gabriel (35) and her two children, Cäzilia (7) and Josef (2); and the maid Maria Baumgartner (44). The two-year-old Josef was rumoured to be the son of Viktoria and her father Andreas, who had an incestuous relationship. The Gruber family lived at Hinterkaifeck, which was situated next to a forest. Maria was new to the farm, having only just arrived oddly, that day, as a replacement for the previous maid that had left claiming that she thought the farm was haunted by a demon. A few days prior to the crime, farmer Andreas Gruber told neighbours about discovering footprints in the snow leading from the edge of the forest to the farm, but none leading back. He also spoke about hearing footsteps in the attic and finding an unfamiliar newspaper on the farm. Furthermore, the house keys went missing several days before the murders, but none of this was reported to the police. On the night of March 31st, 1922, someone managed to lure 4 of the family members into the barn, before murdered them all with an axe handle. The killer then went into the house where they killed two-year-old Josef, who was sleeping in his cot in his mother’s bedroom, as well as the new maid, Maria Baumgartner, in her bedchamber. Horrifyingly, the autopsy showed that young Cäzilia had been alive for quite some time after being attacked, tearing her own hair out as she lay dying in the barn. The killer then went into the house and killed Josef and Maria in their beds. A terrifying theory concerning the murders, is that someone may have sneaked into the house, lived undiscovered up in the attic for a few days, and then come out to murder the house’s occupants. To further add to this theory, in the days that the bodies were certainly lying dead in the barn, neighbors reported that they had seen smoke rising from the chimneys. Also, someone had been feeding the farm’s cattle. So, if someone had done this, it also seemed as if they had stayed for several days after the murders to take care of the place.